I tried a few different things this week from a Monday race to a broken up longrun. The good news is that I survived everything. 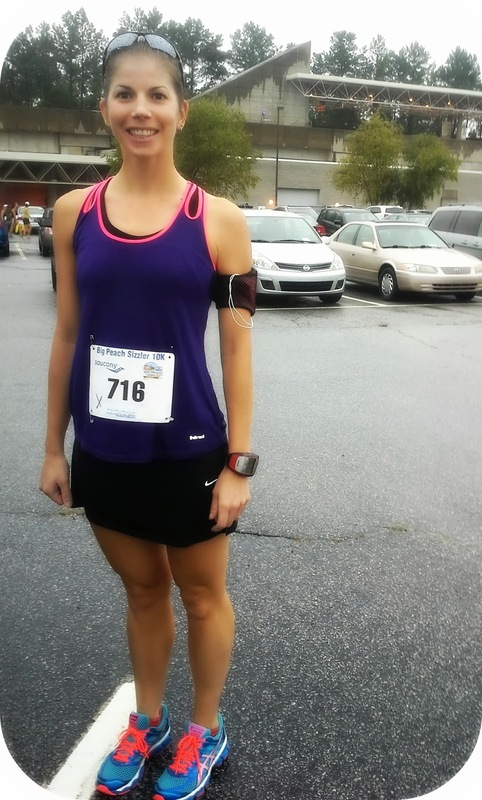 Monday: Big Peach Sizzler 10k Race. Tuesday: Cross training and weights. 25 minutes on the bike followed by squats, leg press, hips, and arms. Wednesday: Off. Long work day. Life wins. Thursday: 4 miler on the treadmill. Wanted to take it easy after monday's race. Felt fine during run, but was a bit tired later. Made for good sleeping. 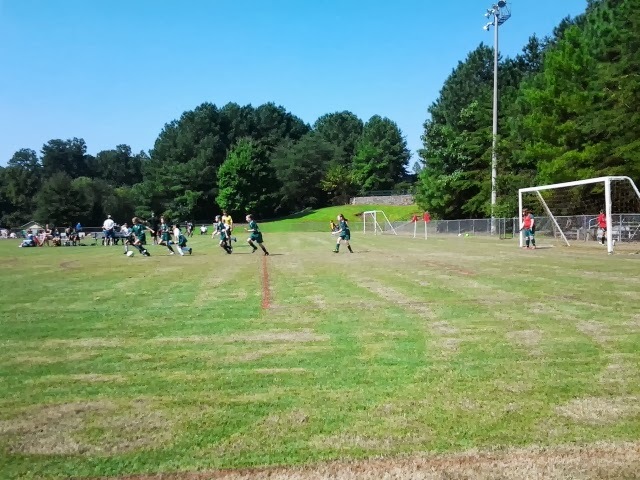 The season opener for the U10 girls was on Saturday morning, so in order to get in my entire long run and get to soccer on time, I broke it up into two days. Friday: 8.33 miles. Start of long run. I ran around work for a few miles and then home. 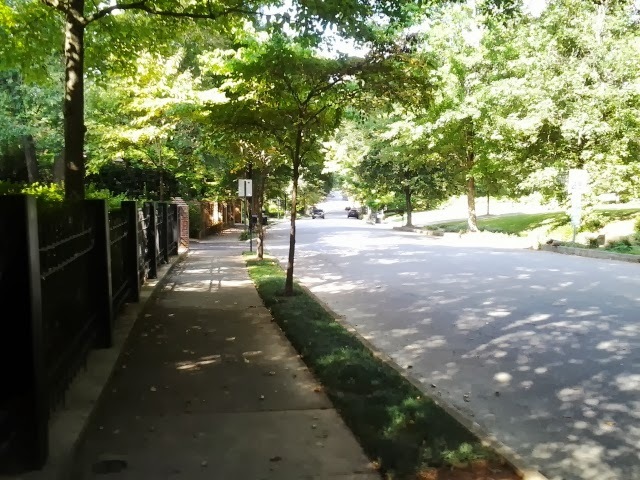 I love the neighborhoods near my work because they have large lovely homes with tree lined streets. Great for running. Got home showered and refueled with lots of gummy worms. Pretty places make running easier. Saturday: 10.25 miles. About 12 hours later, I was up and at 'em again. I ran my usual area around my house. It was cooler than it has been which was a very nice surprise. I felt sluggish for the first few miles, but was able to get into a good rhythm after that. I like the split long run. I was able to run stronger during both run than if I had run 18.5 all at once, but still had the experience of running on tired legs. A tough 5-4 loss for the little ladies. Yes, the sky was really that blue. Sunday: I was bit tired and hungry. I made pumpkin biscotti. It was a good day. Next Week: Cutback week with a race to spice it up. 7 weeks down, 9 to go! In the single digits finally. Looks like a solid training week and nothing can be bad when pumpkin biscotti are involved, those sound great! Thanks! I just keep chugging along! Pumpkin biscotti. Yum! Oh yeah, good job on the training too. They were fun (both the biscotti and miles)! Nice week of training! Isn't it awesome when you hit the single digit countdown? I too missed one workout because life got in the way. Glad it is getting cooler for you. I am so ready for that. I have 7 weeks left, but as soon as I finished MCM I have to look ahead to NoLa full 3 months later. I've never done two back to back training schedule so I am not sure what to expect. Marathon Training Week #8: It's Halftime!